Your privacy is very important to us. Any personal details that you share with us are of the strictest confidence and are not shared with any third parties unless ordered to be released by a court of law. We encourage you to read this privacy statement and should you have any concerns please do not hesitate to contact us directly. The Man in the Red Coat / Toastmaster James Hasler are trading names of sole trader James Hasler. James can be contacted through any means indicated on this website and by the full contact details listed at the end of this statement. 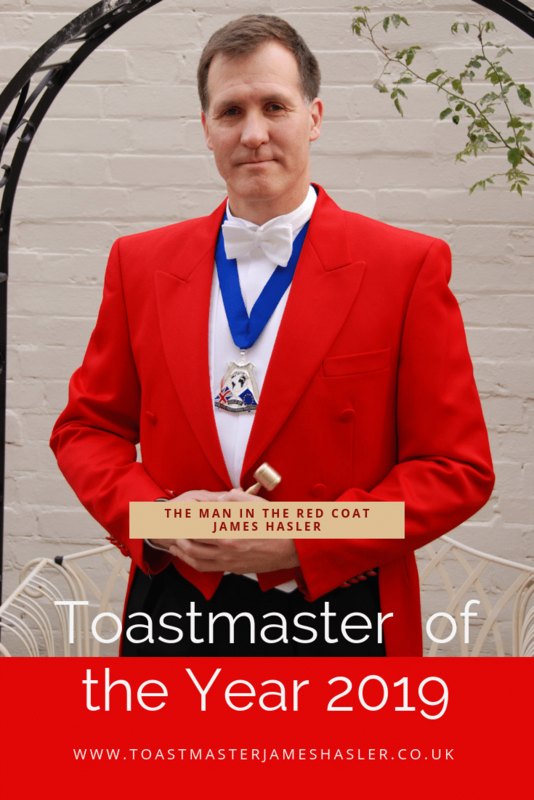 The Man in the Red Coat is a facilitation service for events of all kinds incorporating, professional toastmaster services as well as “voice of god”. This statement refers to all personal details that are provided to us by using the contact form on this website, The Man in the Red Coat Facebook Page, @SpeakerJHasler Twitter, @HaslerJames Instagram or telephone, as well as information passed onto “The Man in the Red Coat” from an associated organisation. Please be aware that data only comes into “The Man in the Red Coat”. None is shared from “The Man in the Red Coat” to others. The data you provide will solely be used directly in conjunction with any contract that we may form together so that I may provide you with services you have requested. In the case where no contract is formed, details you provide will be deleted once it has been established that no contract is to be made. Data is only held to enable “The Man in the Red Coat” in the course of engagement. All data held is provided either by a source to whom The Man in the Red Coat is a supplier or directly from the client. Data is not being shared or transferred outside the European Union. All data is held electronically with a hard copy only processed if a contract is entered into. All data is protected by a password and copies not stored electronically are kept under lock and key. In the case of a contract being entered into. All details held for the duration of the contract. In the case where no contract is entered into. You are within your right to request all personal data held by “The Man in the Red Coat” and it is your right to request access to any data held at any time. Data will automatically be deleted in accordance with the aforementioned policy, but can be deleted upon request within the time limits previously specified. Please be aware that where any contract has been entered into, doing so whilst the contract in operation, may hinder works yet to be completed. Cookies are small text files stored on your computer by your browser. They’re used for many things, such as remembering whether you’ve visited the site before, so that you remain logged in – or to help me work out how many new website visitors I get each month. They contain information about the use of your computer but don’t include personal information about you (they don’t store your name, for instance). This policy explains how cookies are used on Toastmaster James Hasler` website in general – and, below, how you can control the cookies that may be used on this site. The website and servers collects information automatically when you visit the Website, using cookies. The cookies allow to identify your computer and find out details about your last visit. You can choose, below, not to allow cookies. If you do, I can’t guarantee that your experience with the Website will be as good as if you do allow cookies. Internet Explorer http://support.microsoft.com/kb/278835 (this page links to further information for different versions of IE – the mobile version is at https://www.windowsphonearea.com/10-tips-protect-privacy-windows-10-mobile/). The following types of cookie are used on this site. I don’t list every single cookie used by name – but for each type of cookie I tell you how you can control its use. Other social media networks or platforms meant to share the content of the website through the sharing buttons. I might sell some space from this website to advertisers or third parties – they pay for the content you enjoy for free. As part of this, I use several services to help me and advertisers understand what adverts you might be interested in. These cookies hold information about the computer – they don’t hold personal information about you (ie it’s not linked to you as an individual). But they might hold a record of what other websites you’ve looked at – so I could show you a car advert if you’ve previously visited a motoring website. These are the services I use and how you can control those cookies. Please note that turning off advertising cookies won’t mean that you are not served any advertising merely that it will not be tailored to your interests. These are used to maintain your identity or session on the Website. THIS WEBSITE AND ITS CONTENTS IS THE COPYRIGHT OF THE MAN IN THE RED COAT 2018. ALL RIGHTS RESERVED.